Instagram stories, landing pages, KPIs, SERPs, Click-thrus, the list goes on... The ad world of 2018 can at times seem disembodied from that of its early 20th century predecessors. The invasiveness and pervasiveness of digital ads can easily make consumers yearn for the days of nostalgic print advertising and long-form newspaper ads. Though there is no glory in reverting to old advertising methodologies for the sake of nostalgia, there are some strategic takeaways that can be garnered from reflecting on our marketing past. The following is a spotlight on one of the creatives that built a brand that is still relevant and revered today. When it comes to beer, it is hard to come up with a brand more iconic than Guinness. Immediately ‘strength’, ‘goodness’ and ‘toucans’ come to mind. This is by and large the work of John Gilroy, the head creative that crafted much of the Guinness branding and ad campaigns that are in the Guinness DNA. He was also the first artist to sign his work in the finished form, a practice to become much more popular in the mid-twentieth century. When Gilroy was assigned the Guinness account in the 1920s, sales had been steadily decreasing over the past 10+ years. You can see past advertisements, pre-Gilroy below. Guiness ad from 1910s. Noticeably different style and branding from Gilroy’s creative. ‘Make it bold, make it clear, make it vigorous’ were Gilroy’s guiding ad principles, and this is very evident when observing the bold type, sparse palette and humor in Gilroy’s creative for Guinness. 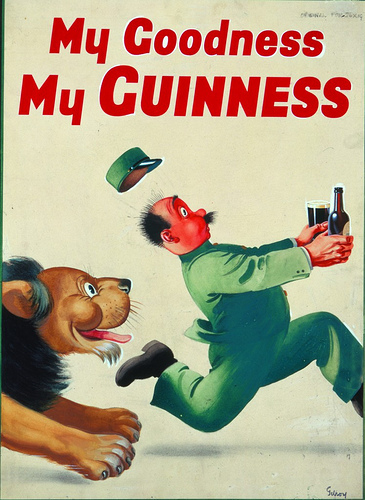 Guinness Poster from 1930s. John Gilroy. One of Gilroy’s largest accomplishments was the empathy the public felt toward his drawings. 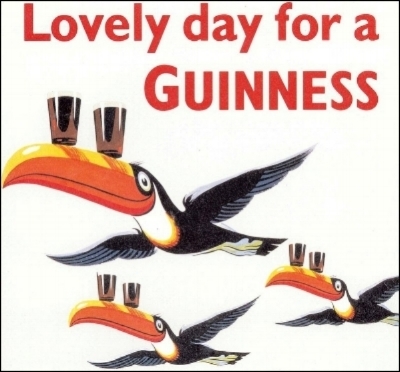 With a bit of humor, warmth and anthropomorphism, Guinness captivated the public via posters, print, and point of sale marketing. Crying oysters, smiling beer heads and thirsty lions made stout celebratory and playful. 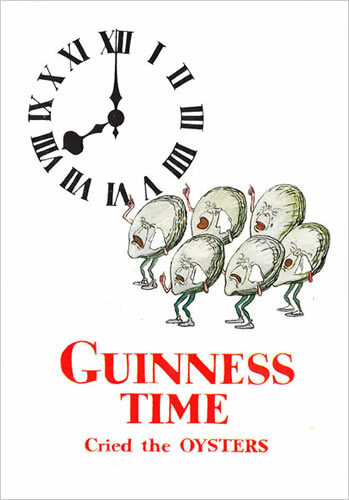 These concepts unquestionably still have a hold over the current Guinness branding. Picture of gift store in Dublin Guinness Museum. Note the toucans. Though Gilroy concluded work with Guinness in the 1960s when his agency, Benson, lost the account, Guinness offered him an annual honorarium for the next couple decades until he died. In this context, it is important to ask, what are we doing in our current digital ad campaigns that will have this sort of impact with customers almost 100 years later? What perennial strategy are we putting in place? One that encourages empathy, elicits nostalgia and survives decades? Gilroy was more than red font and thirsty zoo animals. He was Guinness. This post summarizes the much more detailed history of Gilroy in Guinness in David Hughes’ Gilroy was good for Guinness. I would highly recommend this book to anyone that appreciates advertising history, Guinness, or is curious about brand evolution.